Kipper is my first venture into the Border Collie Breed. He has to have all his people in the same room at once so he can keep an eye on everyone! Kip shone in the conformation ring at an early age, beating specials from the puppy class. He ranked in the top twenty in conformation at only 1 year of age, and ranked no. 4 by breed in the U.S. in 2001. 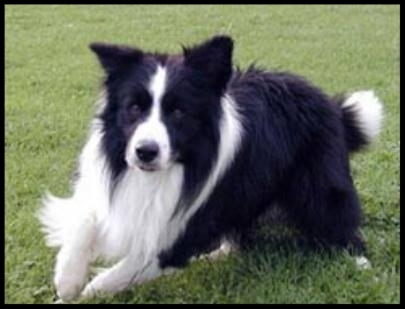 Just reaching two years old in December, 2001, Kip was the highest ranking Border Collie whelped in the U.S. He continued to excel in the conformation ring through mid-2002 with many group placements, including a Herding Group 1 win. Kip took time out to campaign in Europe where he gained his Belgium conformation championship but unfortunately, to be a full champion you need to pass a working test held once a year and Kip came back to us before that. He also had many wins in different countries. Since his return in 2003, Kip has won Best of Breed 21 times and acquired 7 group placements with limited showing. He also enjoy training for agility and herding.